Explore percussive beats, rhythm and movement hand drumming on outdoor Tuned Drums. These 5 drums are styled with a distinctive Afro-Cuban influence and a unique shaped sound chamber, similar to conga drums—creating a voice like a tom-tom. The drum caps are 15", 12", 10", 8" and 6" in diameter and made entirely utilizing maintenance free, ultra-durable molded plastic. 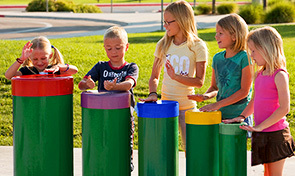 Drum barrels are standard in the color green and caps come in a choice of rainbow, natural, moss or taupe colors. 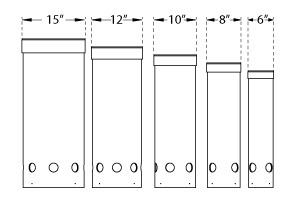 Ensembles instruments are specifically configured for portable, in-ground or surface mount installation, the bases are factory cut for Adult or Toddler 'Finish Height'.